Home ownership is one of life's most fulfilling achievements, but it comes with a lot of responsibility. A home gives you comfort and stability. Consequently, the maintenance of your home requires you to be observant and diligent in its regular upkeep. Time is needed to accomplish the necessary tasks. Sometimes, home ownership requires more upkeep than you have time for. Sears Handyman Services can help with the care and maintenance of your home. The Sears Handyman Services technicians are available to you for all your home maintenance needs. Handyman technicians are experienced in service and repair projects, and are trained and background checked, for your safety and assurance. Our technicians are able to facilitate repairs, make home improvements, and complete installation projects. Sears Handyman Services can provide you with technicians trained in repair, clogged drains, leaky faucets, or replacing a cracked toilet. Technicians are also experienced in small building projects like fencing, decks, and patio door installation. 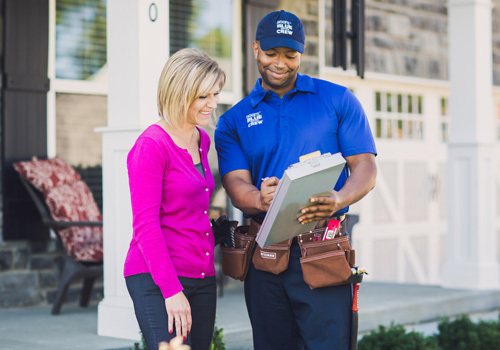 With Sears Handyman Services by your side, home ownership will be less demanding of your time. Give us a call at (973) 586-5181. Our technicians are trained to repair, install, and replace lighting, ceiling fans, and fixtures. Sears handymen also have experience with LED installation. If your electrical situation requires a solution, a service technician can help with your electrical issues. Broken, cracked, and flaking drywall can be unsightly in your home. A Sears Handyman Services technician is trained to repair and patch drywall. Whether you need the drywall to be fully replaced or just patched up, a Sears Handyman Services technician can fix drywall. Warm summer afternoons and calm nights, the family deck is a gathering hub for families. The deck has long since become the place for outdoor dining or poolside relaxing. With the change of seasons, decks need staining and repairing. We can even build you a brand new deck. Sears Handyman Services will tackle these projects for you, so that you and your family can enjoy your outdoor fun without the worry. Whether it is wood, chain link, or composite, fencing your property is a sure way to create privacy and boundaries for your home. A Sears Handyman Services technician will address your needs regarding how to create privacy while still beautifying your home. Leave the climbing, lifting and clean up to Sears Handyman Services. Painting your home is a sure way to perk up your décor and instantly bring new life to your home. Technicians are ready to remove wallpaper and paint to revive your home. If it is the exterior that needs a facelift, we will reach high and low to make your home look alive again.